Do you know how you are perceived by your peers? In real life and online? In the physical world, you could be seen as intelligent, thoughtful and hard-working, but on the Web you could be looked at as irrational, selfish and slothful. There's just something about the Internet that takes away a person's judgement and replaces it with impulsiveness—especially when it comes to Facebook. What was the last thing you "liked" on Facebook? Was it something your parents would dislike? Maybe a potential employer? College recruiter? With the rapid growth of Facebook, more job recruiters and college scouts are hitting up online profiles to evaluate a potential candidate for work or school. In fact, seven out of ten employers search the Web for the lowdown on potential employees during the hiring process. Facebook isn't just about family and friends anymore, so a little forethought into your online actions helps secure the reputation you want. Something else that helps is Reppler. The social reputation monitoring service will evaluate your Facebook profile and provide you with a cyber-makeover, making it safe and clean in anyone's eyes—even your mother's. 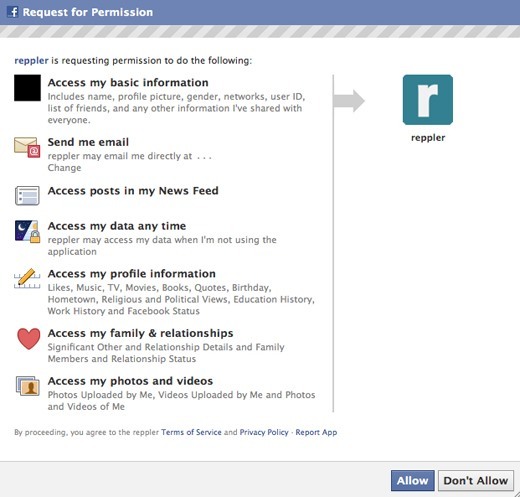 To start, first you need to grant Reppler permission to the information in your profile. My Impression: Reppler analyzes your content to give you a feel for how others might perceive you. For example, Reppler tells a user the tone of the language they use, whether it is positive, negative or neutral. My Inappropriate Content: Reppler flags content in your social networking profile that might be considered inappropriate. For example, derogatory language, profanity, drug/alcohol-related comments are flagged. My Security and Privacy: Reppler alerts you if you have any publicly-available personal information they have that should be made private to prevent hackers from getting into your accounts. Reppler also notifies you of any malicious links in your profile that could result in malware and phishing scams. After doing a quick scan on my Facebook profile, Reppler stated my impression as "partly positive," which seems good, though I'm not entirely sure what that means. Also, the majority of my inappropriate content hails from my friends posts on my wall, which is not surprising to me. Something else not surprising—47% of Reppler's users have profanity on their Facebook walls. 56% of the posts/comments with profanity on a user's Facebook wall come from friends. For me, that's 66%. Also, the most common profanity is derivations of the "F-word". Second to that, derivations of the word "sh*t". "B*tch" is a distant third. My wall favors the first and third words. If you don't care about your Facebook reputation, it's at least worth checking out for security reasons. And if not for that, it'll at least be fun to see all the curse words on your wall. To try it out, go to their website or visit their Facebook page. Similar sites to Reppler include socioclean and reputation.com, the latter expected to integrate Facebook soon.